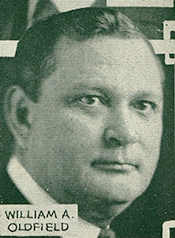 OLDFIELD, William Allan, (husband of Pearl Peden Oldfield), a Representative from Arkansas; born in Franklin, Izard County, Ark., February 4, 1874; attended the public schools and was graduated from Arkansas College at Batesville in 1896; taught school; enlisted in 1898 as a private in Company M, Second Regiment, Arkansas Infantry, during the war with Spain; was promoted to first sergeant of the same company and later to first lieutenant, and was mustered out with that rank in March 1899; studied law; was admitted to the bar in 1900 and commenced practice in Batesville, Ark. ; prosecuting attorney of Independence County 1902-1906; unsuccessful candidate for election in 1906 to the Sixtieth Congress; elected as a Democrat to the Sixty-first and to the nine succeeding Congresses and served from March 4, 1909, until his death; chairman, Committee on Patents (Sixty-second and Sixty-third Congresses); minority whip (Sixty-seventh through Seventieth Congress); had been reelected to the Seventy-first Congress; died in Washington, D.C., November 19, 1928; interment in Oak Lawn Cemetery, Batesville, Ark. Papers: 1910, 1 item. A letter from W.A. Oldfield in Washington, D.C., to W.L. Baugh in Searcy, Ark, written on March 8, 1910. Papers: 1909, 1 item. A typewritten letter, signed, June 4, 1909, from William Allan Oldfield to Hon. Geo. W. Reed, H[e]ber. In the letter, William Oldfield responds to a request for restoration of "the status of those persons serving in the 4th Arkansas Mounted Infantry Volunteers," expressing doubt that the measure will be considered in the current session of Congress. Papers: 1910, 1 item. A law case book, ca. 1910, containing printed, typed, and handwritten records of cases in Arkansas, from ca. 1838-1910, compiled by William A. Oldfield. The book shows precedents and forms of indictments for various offenses. Papers: In the Thomas Walker Page Papers, 1906-1937, approximately 4 linear feet. Correspondents include William Allan Oldfield. United States. 70th Cong., 2d sess., 1928-1929. House. Memorial services held in the House of Representatives of the United States, together with remarks presented in eulogy of William A. Oldfield, late a Representative from Arkansas. Washington: Government Printing Office, 1929.